Storytelling: What’s In It for You? This article first appeared in the Winter 2018 issue of Change Agent. Learning how to build a storytelling culture at work is easy, given the abundance of good articles on the subject. They all give sound advice on the steps to take, especially at the leadership level, to get the support and funding needed to teach co-workers how to write or tell inspiring stories that will help the organization reach its goals. But the “how” is not likely to be applied if the “why” is not clear. Why take the time to apply what you’ve learned about how to make your organization more story-focused? It is a big commitment of time, especially in the beginning, and can require patience. So why bother? There are three answers, all which have become clear to me since I started applying the “how” at World Wildlife Fund (WWF) five years ago. They come down to having more fun at work, making your job easier and broadening your opportunities. These are all “you-centric” but will, ultimately, benefit the whole organization too. On the fun side, my frame of reference is that I work with a lot of scientists and policy experts—particularly, over the past three years, with those who are working on WWF’s goal of saving the world’s forests by 2020. That’s an ambitious goal, and incredibly important. The lives of people, animals and plants all over the world depend on forests. Rightfully so, my fellow “pandas” (as we call ourselves) take their work very seriously. They do extensive research, comprehensive analysis of the data they’ve gathered, and thoughtful preparation of the findings, which they hope will be used to create better policies and programs. Their means for reaching their target audiences often are a paper, slide deck or fact sheet—most of which, in my opinion, are dry or dense. Asking them to weave a story into their materials, preferably before addressing their data or findings, used to fall on deaf ears. Why, they would ask me, should we write a web story about a park ranger from Bhutan whose life is on the line every day because he does not have the proper equipment to detect illegal loggers and wildlife poachers in the dense forests he manages? Why not just present the numbers we have that show the annual gap between what is available to properly manage a forest and what is needed? And why, they would wonder, start their presentation with a story about the work they did with indigenous communities many years ago—the work that inspired them to get into forest conservation? Why not just jump into the three goals of our new forest conservation strategy and the research we did to come up with the strategy? I was eventually able to get them to open their hearts and minds to this by telling them that, just as they rely on science to do good work, so do communicators. I shared with them some of the compelling research that shows people are more likely to want to hear about data and findings if they, first, hear a story that taps into their emotions. I was fortunate that the leader of the forest team got it early on. He gave me and a few other communications colleagues the chance to speak about storytelling for a few hours at the team retreat. Then he allocated resources so I could hire storytelling guru Andy Goodman to lead a few workshops for the team. Whether willingly or unwillingly agreeing to go to the workshops, the outcome for all of the participants was the same—a realization that storytelling can help them get their job done. And it’s not as scary as they had thought. Ever since then, my job has been more enjoyable. We start every monthly forest team meeting with one panda telling a five-minute story. And I’ve seen storytelling woven into colleagues’ conference presentations, reports and media interviews. Sometimes I have to remind them to do so, but, more often than not, they are now doing so on their own. Unconsciously—or perhaps consciously—storytelling has become an opportunity for them to explore. Explore the human dimension of their work. Explore not just what they know but also how they can use what they know to inspire sincere and lasting change. Explore their emotions. Watching that evolution is fun. Introducing a storytelling culture at work will make your job easier, although perhaps not at first. I needed a few people to take the time and have the courage to apply what they learned about storytelling. But once they told or wrote their first story—or came up with a good story idea that I then brought to life—and enjoyed the experience of doing so, they were hooked. And they inspired others to go down the same road. Instead of being the lone voice for storytelling and the lone person writing and telling stories, I have created a team of people who are my eyes and ears—and sometimes authors—for stories. At my organization, having extra eyes and ears is important. WWF is a gold mine of amazing stories. Every month, at least one person on the forest team is travelling, usually in the developing world. They are going to meetings in large, crowded cities. But they also are in remote communities, where they see what they and others at WWF strive for—expansive, lush, healthy forests. They also see the threats to those landscapes—illegal logging, unsustainable mining, massive palm oil plantations where dense forests once sat, and more—that they are working hard to stop. And they are meeting people whose lives depend on the forests we discuss in our meeting rooms—the people who directly benefit from WWF’s work. It’s impossible to walk away from such a setting without a story. The pandas I work with often did find the stories. But they usually didn’t take the time to build them out. And they didn’t tell them at work. They saved them for after-work happy hours, campfires with friends, and personal journals. Now they do. They’ve seen—through analytics and anecdotes—that storytelling works. And for the most part, they enjoy it. As a result, my job is easier. I’ve got more story ideas (from them) to share at our editorial meetings. And I don’t get raised eyebrows when I ask them before leaving for a trip to look for stories or, after getting back from a trip, to set aside a half hour in their busy schedules to tell me what they dug up. Also, their stories have been a way for me—not just the target audiences we need to reach—to better understand their work. Ultimately, that makes my job more manageable and fun. Last, stories will broaden your opportunities at work. The time I spend helping scientists and policy experts on my team craft their stories is time for me to get to know them better. But more important is the vice versa. They get to know me better and, ultimately, gain a better understanding of why I matter and why communications matter. Communications, they realize, is essential to reaching their goals. The upshot is that communications line items appear more than ever in budgets attached to funding proposals. They’ve either added the line item on their own or added it at my request, without shirking. We’ve obtained funding to produce videos about Devi, a woman from Nepal who is trying to empower others in her community to speak up and be environmental leaders. And photo essays about chefs in Peru who are sourcing their ingredients from the Amazon. It’s their contribution to supporting those doing sustainable farming in the region, a much better alternative to the illegal gold mining that tempts many locals in the region. I also receive funding to add an extra day or two to my trips so I can offer communications training, including storytelling, to staff in our far-off offices. 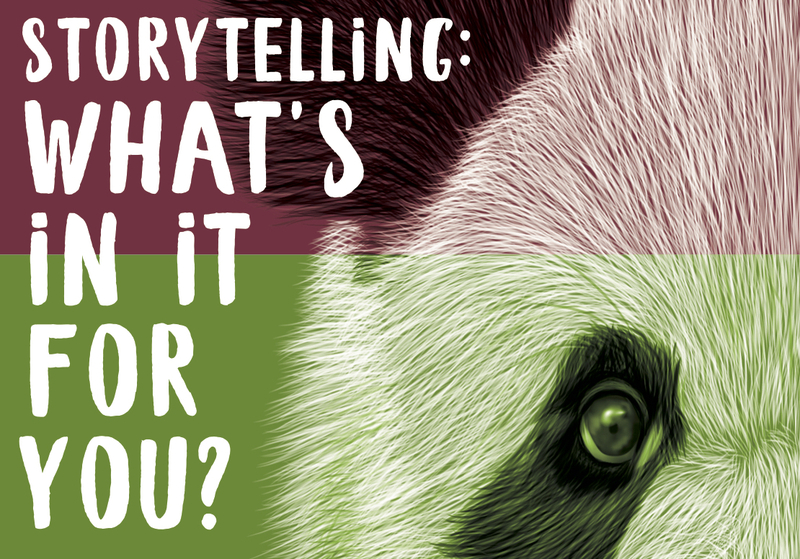 I expect to learn more over the years about why encouraging a storytelling culture at work is rewarding for me and important to meeting WWF’s mission. Until then, I tip my hat to the people who so eloquently explain how to encourage such a culture. Combined, the why and how lead to smart and deliberate communication that can drive meaningful change in the world.